With circulation of 21,28,545 copies, Dainik Jagran was and is No. 1 newspaper of Uttar Pradesh! 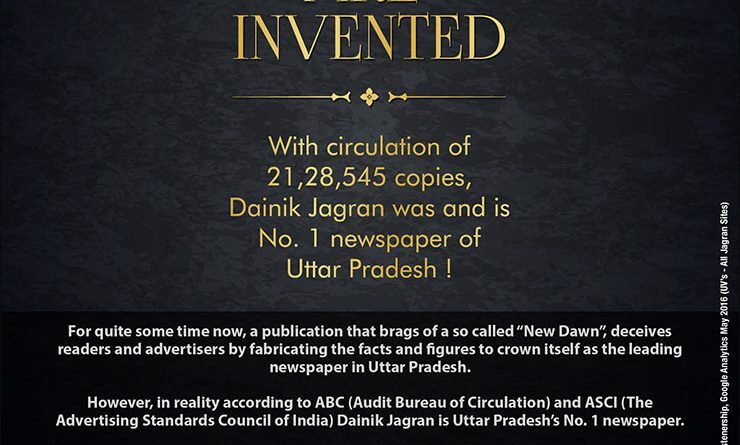 For quite some time now, a publication that brags of a so called “New Dawn”, deceives readers and advertisers by fabricating the facts and figures to crown itself as the leading newspaper in Uttar Pradesh. However, in reality according to ABC (Audit Bureau of Circulation) and ASCI (The Advertising Standards Council of India) Dainik Jagran is Uttar Pradesh’s No. 1 Newspaper. 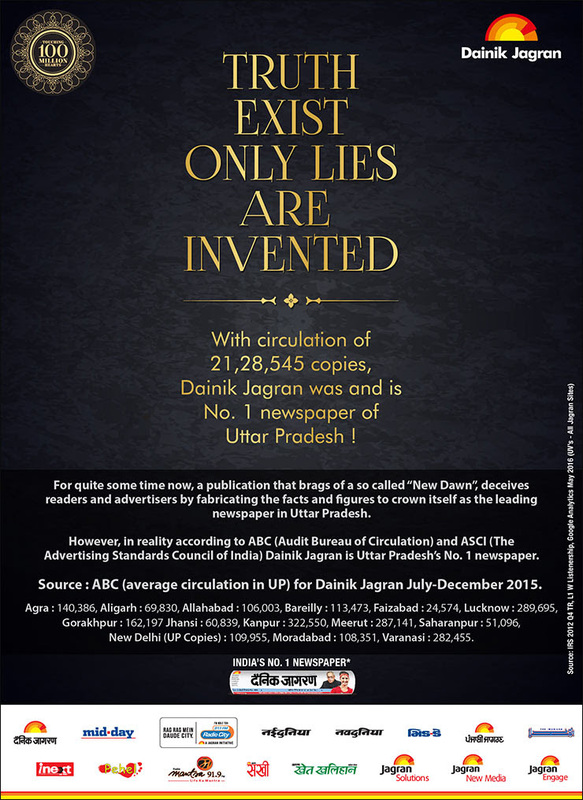 Source: ABC (average circulation in UP) for Dainik Jagran July-December 2015. Agra: 140,386, Aligarh: 69,860, Allahabad: 106,003, Bareilly: 113,473, Faizabad: 24,574, Lucknow: 289,695, Gorakhpur: 162,197, Jhansi: 60,839, Kanpur: 322,550, Meerut: 287,141, Saharanpur: 51,096, New Delhi (UP Copies): 109,955, Moradabad: 108,351, Varanasi: 282,455.
dainik jagran is really no 1 newspaper of india.